Assuming your financial year is from January to December; and you wanted to start recording your account into MoneyWorks from year 2012. In the setting up new company wizard, Period setting, Set “Financial Year” to “Jan-Dec” and select “2012” in the “Start in” field. 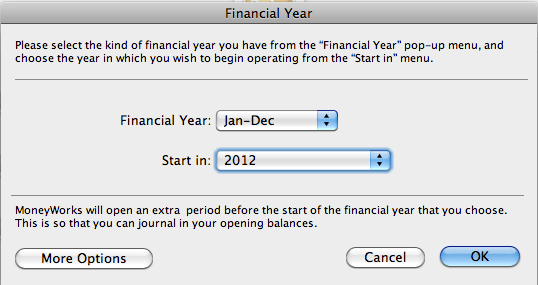 In the Period management window, you will discover that MoneyWorks automatically create a period (Dec 2011) before your financial year, Jan – Dec 2012. The Dec 2011 period, which created by MoneyWorks, is to allow you to enter the closing balances as of 31 Dec 2011. 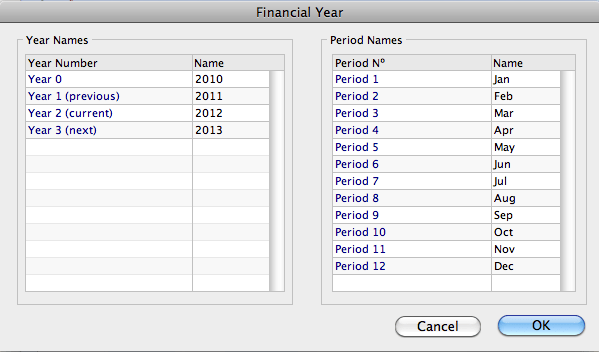 In the Financial Year setting window, you can check the Period Names and Year Names setting as according to what you have set earlier. This entry was posted in MoneyWorks, MoneyWorks v6 and tagged accounting software, Financial Period, MoneyWorks, MoneyWorks Singapore, Singapore, Small Business Accounting Software, software. Bookmark the permalink.